Elegant home in the sought after Sonoma Ranch. Stunning open floor plan. 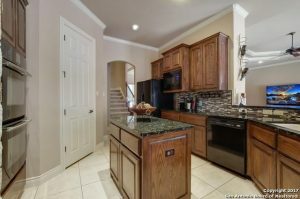 Crown molding, triple raised ceilings and expansive windows throughout. 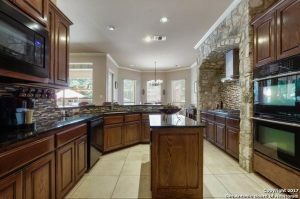 Kitchen has beautiful stone work, granite counters, an island and breakfast bar. Large master suite. Huge media/game room with endless possibilities. In home study with wood floors and custom paint. 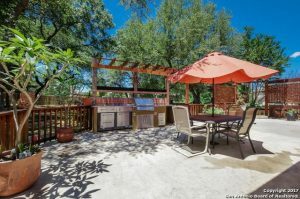 Entertainers dream with oversized concrete deck and outdoor kitchen. All of this on over half an acre with tons of trees. Close to 1604 and shopping. AMAZING KITCHEN YOU WILL LOVE! Cavayo Trl Helotes, is one of the most desirable areas in the entire San Antonio Texas region. With excellent schools and a close proximity to the city. it’s an oasis just inside of the city. Thank you for reading about 203 Cavayo Trl Helotes, TX 78023.